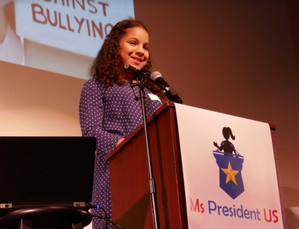 Following nine months of dedication to developing their leadership skills, 26 young girls from Ridgefield and Danbury came together at The Ridgefield Playhouse on Sunday, May 6th to present their campaigns to become the first Ms President US of their town. More than 200 were present to support and congratulate the girls, including elected officials, state, and community leaders: CT State Senator Toni Boucher, CT State Representative John Frey, First Selectman Rudy Marconi, Selectwoman Maureen Kozlark, Board Chair Fran Walton, Director of the Ridgefield Library Brenda McKinley, Board Chair for the Women's Center Glori Norwitt, Executive Director of the Danbury Grassroots Academy Lauren Dalton Bailey, and the CEO of CT Girl Scouts, Mary Barneby. Hosted by Christine O'Leary with DJ entertainment by Garrett Booth and Tad Fleuette, the event was a celebration of each girl's accomplishments throughout the year, including their newfound speaking and presentation skills. 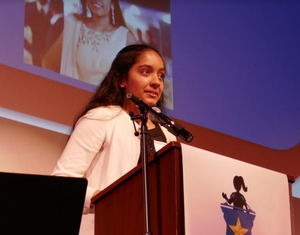 When final votes were counted by the Mentors, Mr Marconi announced the Ridgefield winner, Hersha Chauhan, an 8th grader at East Ridge Middle School who addressed the importance of combating social media abuse and improving mental health services. 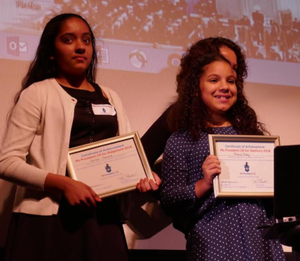 Ms Bailey then announced the Danbury winner, Brianna Razeq whose campaign was focused on anti-bullying programs. Both winners have been invited by CT State Representative John Frey to receive a citation from the CT General Assembly on Tuesday, May 8th in Hartford, CT.
“Our goal is to inspire and prepare girls for their highest civic leadership positions, and today we had a chance to see the incredible potential these girls have to lead in the future," said Liz Osterhus Fleuette, the program's founder. Ms Fleuette was inspired to start the program in 2016 when her then 8-year-old daughter, Maggie, had memorized the Oath of Office in preparation for winning her own campaign for President someday. Ms Fleuette did not want her daughter to be deterred by the absence of an example of a female President so she looked to local, state, and federal leaders to pave the way for her daughter as well as all girls who aspire to change the world for the better. Since the program's launch in September 2017, more than 50 girls in grades 4th to 8th have participated in monthly leadership sessions, typically held at the Ridgefield Library, with each session facilitated by a group of 22 high school girls serving as program Mentors. The girls had the option to run or support a campaign, and more than half chose to be part of a campaign. The other candidates were: Leena Kuittinen; Mia Colabella and Lexy Barrett; Allegra Craine, Angelina Craine, and Hannah Trotman; Juliana Buckley, Madelaine Brooker, and Avery Baum; Jailynne Dixon and Angie Lopez; Juliette Axen and Casey McClellan; Sierra Anderson and Sophia Rodriguez; Maggie Fleuette and Maya Blackman; Leslie Rodriguez; Murphy Everdell, Madison Pfeiffer, and Moriana Ma; and Lucy Thomas, Rebecca Gold, and Chloe McKinstry. Their topics included: environmental protection, school budget equity, homelessness, gun control, animal rescue, and the importance of community involvement among children. Not only does the program strive to build leadership skills, but it also helps create the mindset that their views matter and they can use their voice to have a meaningful impact on society — perhaps one day achieving the goal to serve our country in its highest public office. 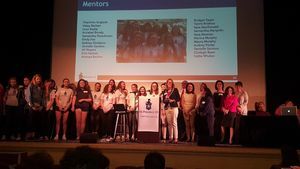 “It was so rewarding to watch the months of hard work on the MPU girls’ end culminate in an exciting community event that rallied a celebration of female leadership,” said Callie Whelan, a presenter as well as Mentor for the program. Ms President US is a 501(c)(3); a non-partisan, non-profit, community-based initiative dedicated to inspiring and preparing girls to aim for the highest civic leadership positions and know they can achieve them.